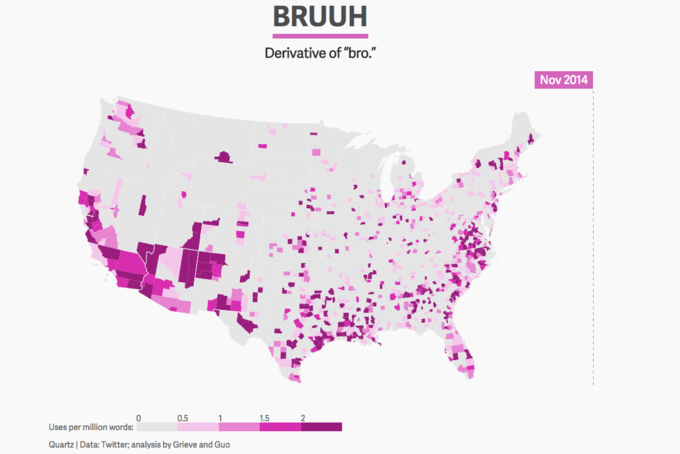 Forensic linguist Jack Grieve has mapped the spread of slang like "bruuh," "baeless" and "on fleek" across the United States, using Twitter data from October 2013 to November 2014. Some slang, like "on fleek," exploded in usage over the course of just a few months, while others slow burned into our lexicon. "African-American English" is largely responsible for the spread of new slang. Phrases start on "Black Twitter" then go into common usage from there. The South is probably the most influential region for slang. Boolin, baeless, bruuh and unbothered all started there.